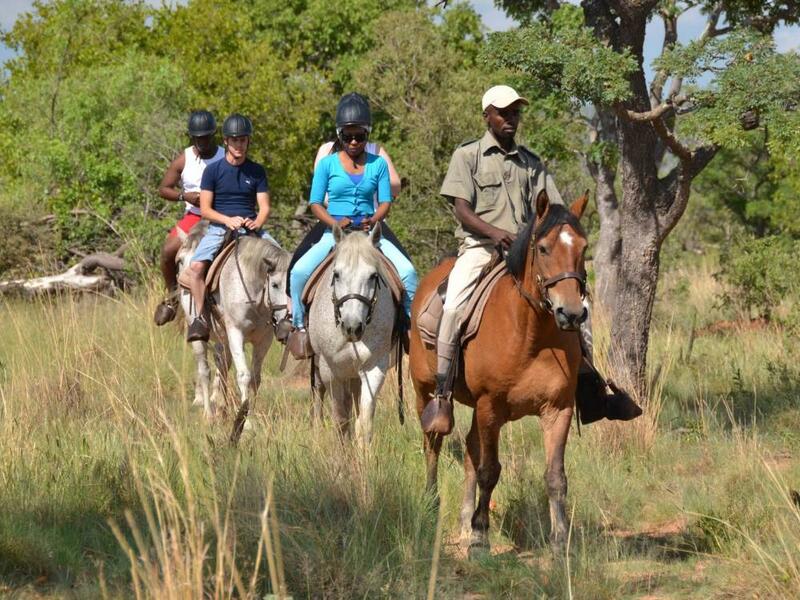 Loads of cool activities on offer – the horseback and quadbike safaris in particular are 2 very different and unique ways of experiencing the bush! 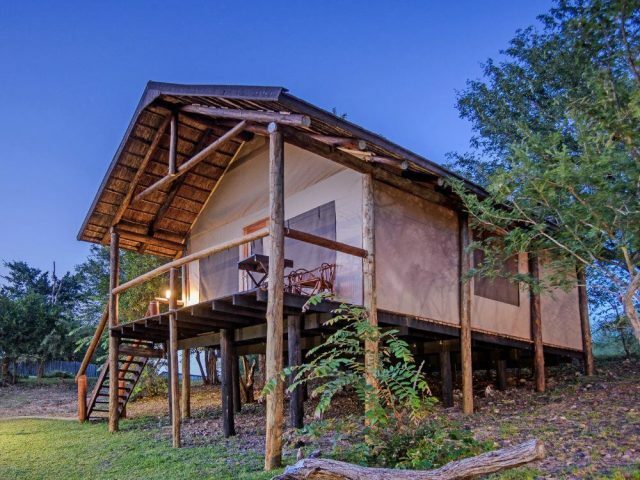 Whilst sister property Mabula Game Lodge is a large 53 room “bush hotel” with loads of facilities, Kwafubesi Tented Camp takes a completely different approach. Everything has been stripped back to basics in the creation of a very personal and intimate little rustic tented camp that seeks to deliver what so many travellers want in their African bush experience: authenticity. We’re sure that all of us have been struck with that urge to just “get away from it all”. Maybe it’s that cellphone that rings once too often during dinner, or that important email that comes just as you’re about to go lock up the office – but eventually there comes a time when we all just want to hit the off switch for a bit and recuperate. And this is exactly where Kwafubesi comes into its own. 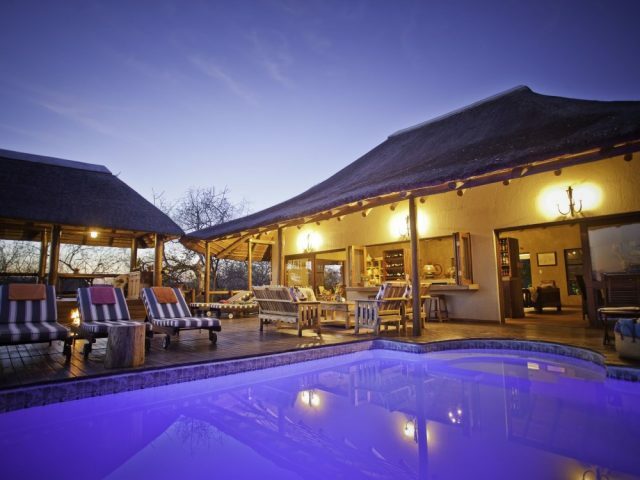 Hidden deep in the heart of the 12000-hectare Mabula Private Game Reserve just 2 hours north of Johannesburg, this little camp lets you get away from the stresses and strains of modern living. 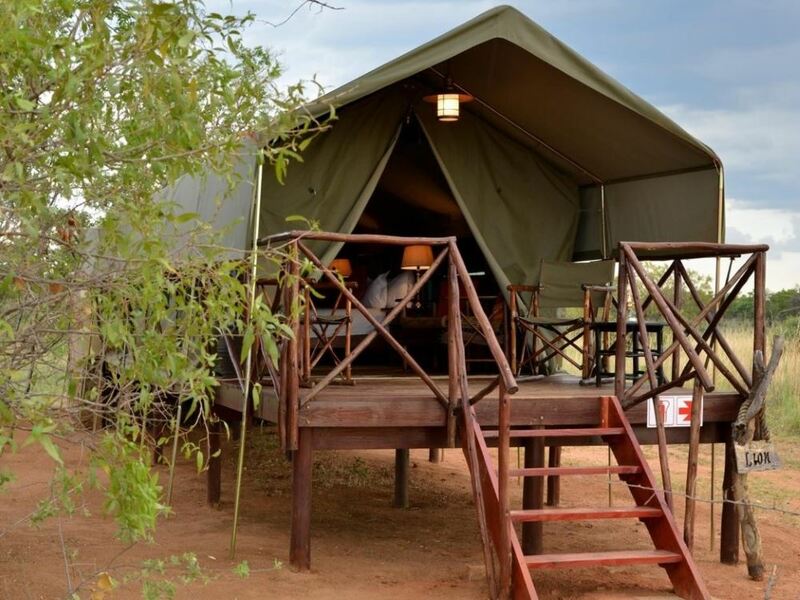 Guests sleep in 5 simple but very comfortable tents on elevated wooden platforms looking out on the bush. 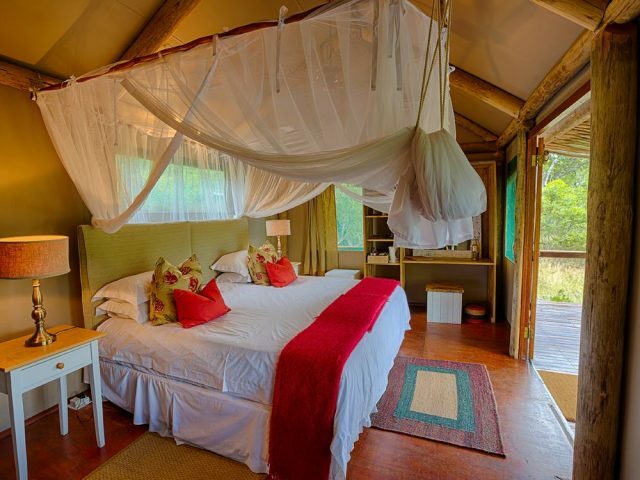 Each tent has a full bathroom en-suite (and here “old-fashioned” isn’t a euphemism for “broken and outdated”: they’re smart, clean and very private, with a shower and large stone tub to have an early evening soak in), as well as its own private deck that looks out over the bushveld. The tents themselves have that simple and homely charm in heaps. Canvas cloth and clean white linen bring simplicity to the room, while bold reds, browns and romantic lamps add a colonial bush style. This old-style charm is reflected in the wooden furniture and wooded touches around the room, which is complimented by the focus on a subtle earthy palette. And in the main lodge, this trend of authentic old-time charm continues. Sitting around the roaring log fire in the boma, eating traditional South African kos (cuisine) under a Milky Way that sparkles like it never can in cities, it’s easy to forget that there’s an outside world of reports and bosses and bills. Many meals are eaten in communal style, with guests chatting at a shared table with your ranger as host. But if you’re more focussed on a romantic evening, then a private dinner served by lamplight on the deck of your tent is likely to do the trick! Of course there’s the usual twice daily game drives through the 12 000 hectares of the reserve where you can spot the Big Five as well as rarities like cheetah (note that the reserve is split into 2 separate sections with the resident lion pride confined to 1 of them), but the beauty of the Mabula reserve is that it offers a host of more unusual options too. And at night, the action continues: with the blazing city lights finally extinguished, Kwafubesi’s staff can take you on a guided star gazing tour (the perfect opportunity to see the stars in their full beauty) or on the awe-inspiring Majuma Experience to see lions hunting in the darkness of Mabula. 8 years and older considered as adults - stay in own tents and pay full adult rates.